What Do Dental Veneers Correct? Home/Blog, Dental Treatments, Tooth Restoration/What Do Dental Veneers Correct? Dental veneers are used by dentists to fix cavities or broken and damaged teeth. Veneers are also used to improve the look of healthy teeth to improve the appearance. This treatment can result in a set of straight, matching teeth of healthy white coloring, giving the patient greater confidence to show off their smile. 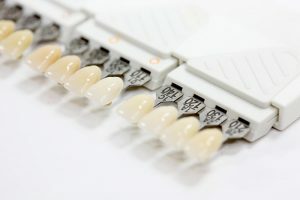 Veneers are a popular choice for patients who would like to get a smile makeover – any cosmetic dental treatment that improves the aesthetics of your teeth. Stained teeth that stubbornly resist whitening treatments can be effectively hidden by veneers. This can be a good option for smokers and people who regularly drink of tea, coffee, and red wine – habits that easily stain your teeth. Damaged teeth due to excessive grinding or intake of carbonated drinks, or accidentally chipped or broken. Veneers can extend the length of a full-sized tooth. Crooked teeth that are formed naturally due to lack of space, and are better treated with orthodontics such as Invisalign aligners. Orthodontic treatments, however, is a longer procedure so some people turn to veneers for a quick fix. Gaps or spaces that have formed between your teeth can be hidden by veneers to produce a better structured and balanced smile. A consultation with your dentist will give you a chance to discuss all your options in restoring your teeth, including whether tooth veneers are right for you. They are a popular choice in Cosmetic Dentistry because they look and function just like real teeth with the light-reflective characteristics of enamel. Dental veneers also resist staining, unlike natural teeth. You should also be aware that the process is irreversible. Teeth veneers may not be suitable for people with unhealthy or weak teeth, or for those who grind their teeth a lot, either in their sleep or as a general nervous habit. When you already have porcelain veneers you still need to brushed and flossed daily for maintenance. Your teeth veneers can be chipped if you are not careful so avoid biting or tearing into hard or chewy foods like ice cubes or even your fingernails.